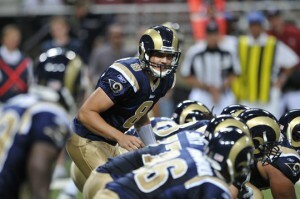 I was so pumped up to finally tailgate and start the NFL season with hope for achange with our new-look St. Louis Rams. We were starting off the season with a winnable game against the NFC WEST champs, the Arizona Cardinals, the defense has stood up opposing teams in the pre-season and QB Sam Bradford was looking like a seasoned veteran against New England and Baltimore the prior two weeks. But the was the regular season and all the starters are playing and Billy Davis (Defensive Coordinator) brought in a heavy bltz scheme to terrorize Bradford make his home debut. As I was watching, the Cardinals were zeroing in on his snap count guessing when to fly off the line, and they were flying! Once I even saw a Cardinal blitzer flying at Bradford’s head! 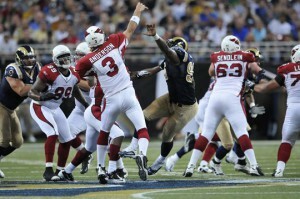 With the Cards blitzing almost every down, the Rams offensive line only gave up 2 sacks. Bradford didn’t have one of his better days. He threw an amazing 55 passes completing 32 of them including a 1 yard touchdown to Laurent Robinson on 4th and goal. Bradford was as comfortable as a rookie could be facing the blitzes he saw, but Bradford was rushing his passes throwing them around receivers ankles. Bradford has seemed to have hit it off with newly aquired wide receiver Mark Clayton, hitting him 10 times for 119 yards with one acrobatic catch for 39 yards. Clayton has only practiced with Bradford and the starters for three days! With that said, Sam had a chance to win this one in the final minutes. We just didn’t have enough time to put one more in the endzone. 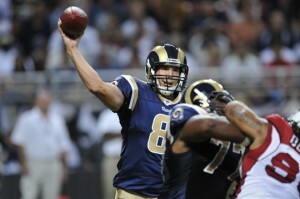 The Rams fell to the Cards 17-13. Now Sam should have his arm under 3 bags of ice. With the ball flying around like it was, we were not running the ball at all. 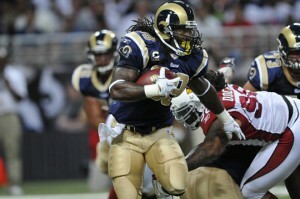 Our main weapon Steven Jackson was all but invisable rushing just 22 times for 81 yards. jackson was bottled up just getting a few yards per attempt in the second half. The line had trouble opening running lanes while picking up the blitzers, so there was nowhere to run. This one falls on the play calling. Send in a few screens and slants to back off the defenders and get Jackson past the intial tackles and give him room to run. The defense had a good game taking the ball away from Arizona three times (fumbles) and sacking Derek Anderson twice for 31 yards. Note to Clifton Ryan, YOU ARE NOT THE FASTEST GUY ON THE FIELD! When you recover a fumble and ramble you 250+ pounds down the field….cover up the ball. What looked to be a sure touchdown turned quickly into a touchback as Ryan was stripped of the ball at the Arizona 1 yard line. The defensive backs sis an ok job covering Larry Fitzgerald only allowing him 3 catches for 43 yards, one of them being a touchdown. The best thing about the game on Sunday, the sound of St. Louis has returned to the Dome after a four year hiatus. The sound of the crowd was deafening, people we excited about how the Rams were playing and it wasn’t even sold out! the amazing thing was that the Rams were trailing the entire game except for early in the third quarter, but that didn’t faze the crazy Ram fans. No we aren’t going to have the Lombardi trophy in town any time soon, but this team is exciting and competitive. We will battle with every team on the 2010 schedule and we will win some close games. Next week: The Black Hole: a space from which nothing, not even light, can escape. And that is where we are playing next week! Bring on the Raiders!!!! 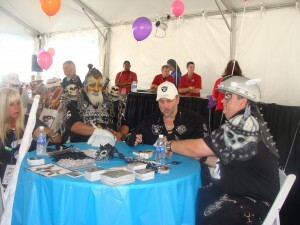 I am Ram Man, getting over a successful tailgate and a hard fought loss to the desert fowl! We will rebound next week and I will see you in the endzone!